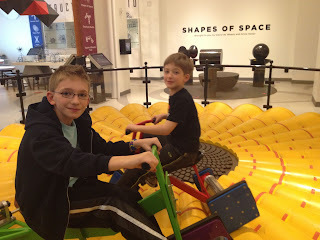 Imagine the enthusiasm from the little C&Gs when we told them we were going to the Math Museum. Not so much, right? 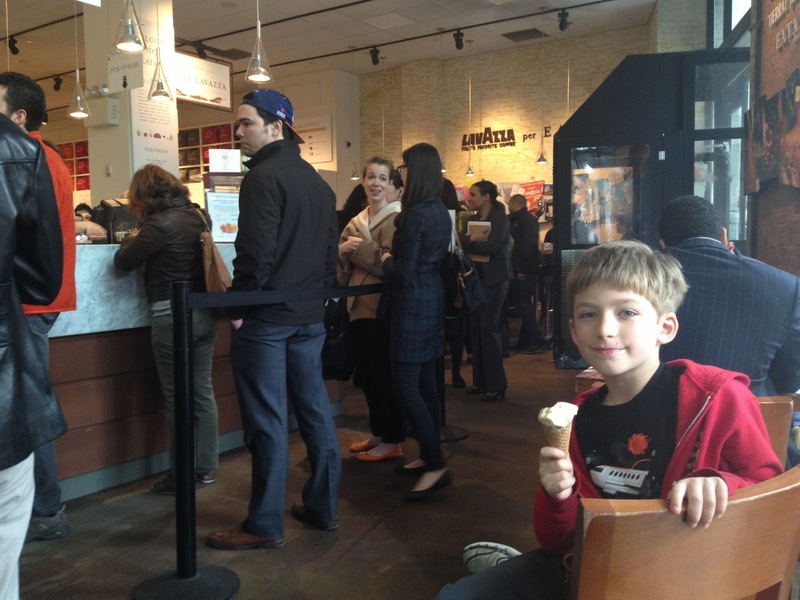 Good thing we promised them lunch (and gelato) at Eataly beforehand. Opened in August 2010 by Mario Batali, Lidia Bastianich and her son Joe Bastianich, Eataly is a giant emporium of all things Italian. Groceries, a full butcher counter, wine, books, a bakery, pastries, espresso, cheeses, gelato, chocolates, oils, Italian sodas (a Big C&G fav), everything either house made or imported direct from Italy. There are countless restaurants, and a few in true Italian style where you order small plates "cicchetti" and eat standing at a tall table. Manzo is the only one you can make a reservation at (more formal and meat centric), but chances are your troops will be making a beeline for the brick oven pizzas and homemade pastas at La Pizza & Pasta at the back of the market. If at all possible, try to get to Eataly for lunch by 11:30. Grandma & Papa C&G were joining us (they wouldn't miss a meal and cocktails in the city!) and our group of six got seated right away. But the closer it got to noon, the longer the line became for tables. Around 12:15 I heard a waiter tell someone it was an hour an a half wait already, and this was on a random Thursday in April. On the plus side they take your cell phone number and they'll call you when your table is ready. Be aware they won't seat you if everybody isn't all together, so don't let your party go wandering too far through the market while you get a table. 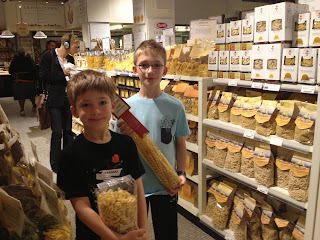 We had to point out the little C&Gs in the nearby pasta aisle before she'd seat us. 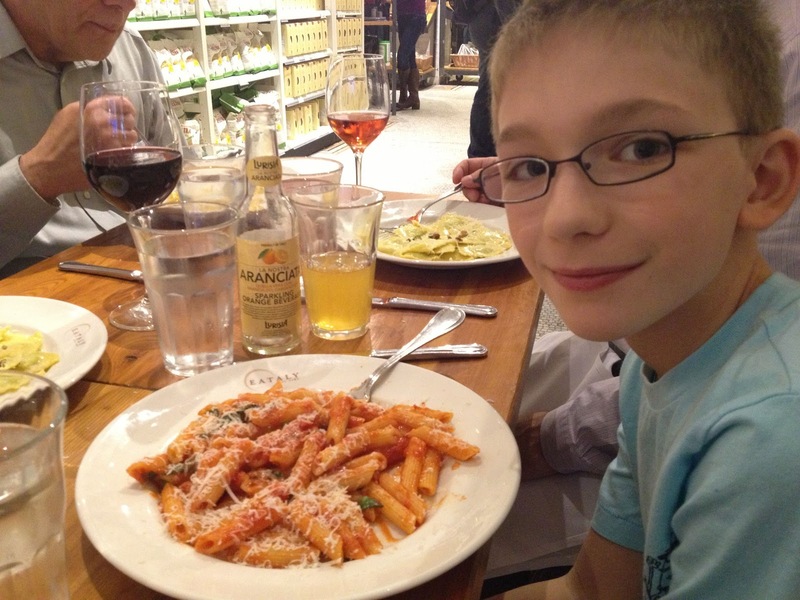 Once we were all settled in with our various glasses of wine (when in Italy) and Italian sodas, we ordered our food and then let the little C&Gs loose again in the pasta aisles. The variety of shapes and sizes were like nothing we've ever seen and I gave the boys the herculean task of picking out one bag each to bring home. Knowing I'd be carrying them I ruled out the super long ones Big C&G kept bringing back to the table. It goes without saying that the food was incredible. Fresh, flavorful, and good enough to make you think you'd landed in the middle of Italy. It was so good that I went back the next day while running errands in the city, grabbed a seat at the counter and had a delicious lunch of ravioli and a glass of rosé. By myself. It was lovely! After lunch we wandered through the market, stopping to watch the mozzarella balls taking form in the cheese department, and to get on line to purchase our goodies. 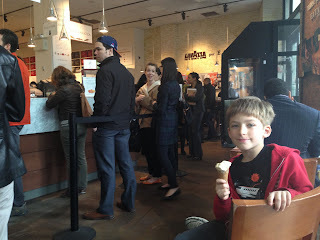 On our way out the door we had to stop for a quick sugar and caffeine boost at the gelato and espresso counters. It was a little nutty at the gelato counter so we didn't get to try any flavors but the little C&Gs had their usual Italian favorites, straciatella and Sicilian pistachio. 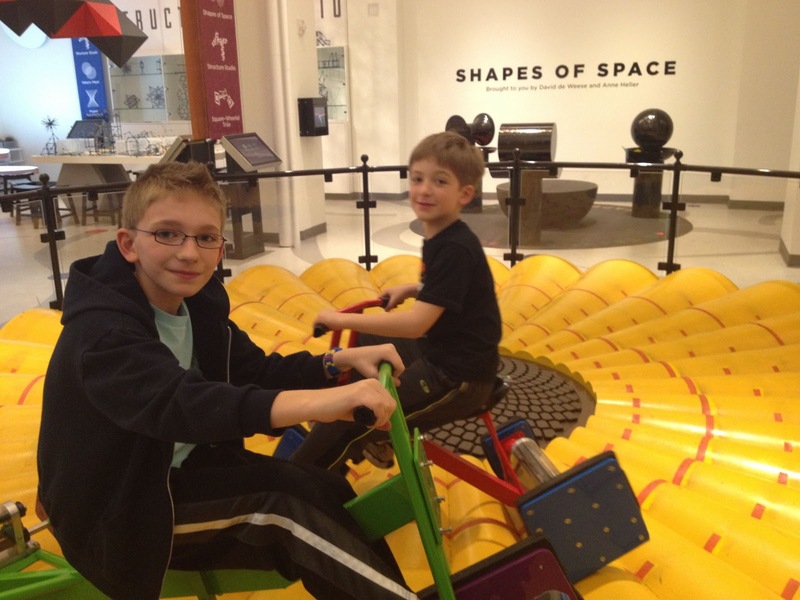 After re-fueling we were all set to head across Madison Square Park to explore the new Museum of Mathematics. Check in tomorrow for my review of this suprisingly fun museum. And where to get martinis after you're done with all that learning! Eataly is on 5th Avenue between 23rd and 24th streets. It's open daily from 10:00am to 11:00pm and keep in mind it gets super crowded around mealtimes and at holidays.